The crunch of walnut pieces and the flavor of dill and chives makes this a perfect cracker for snacking. 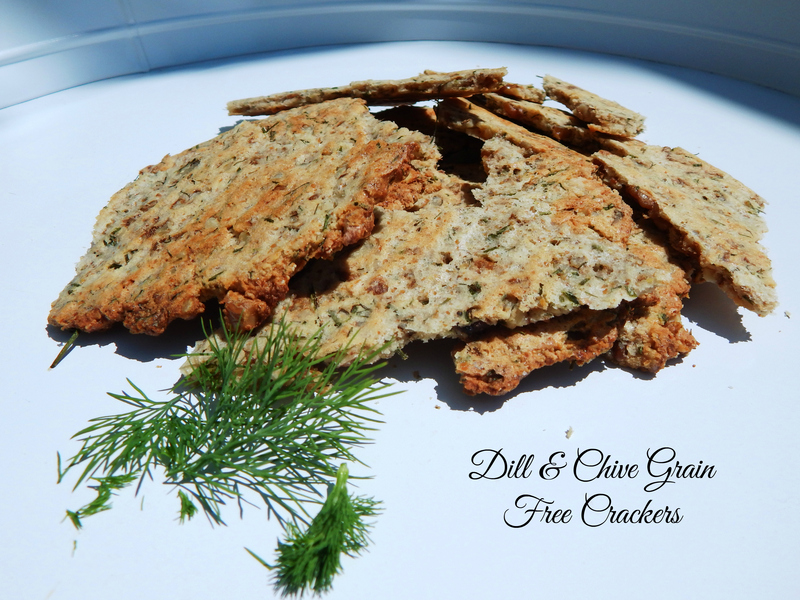 I especially like dill in summer, and it is so good in these crackers! It reminds me of working in the garden as a child and smelling the fresh dill on the breeze and feeling the warm sun on my body. These crackers are a fantastic addition to an appetizer spread, and I also like to mound a bunch of dinner leftovers on them for a quick snack. Who doesn’t love a quick, healthy snack? Prepared in advance, these will keep in the freezer for a month. 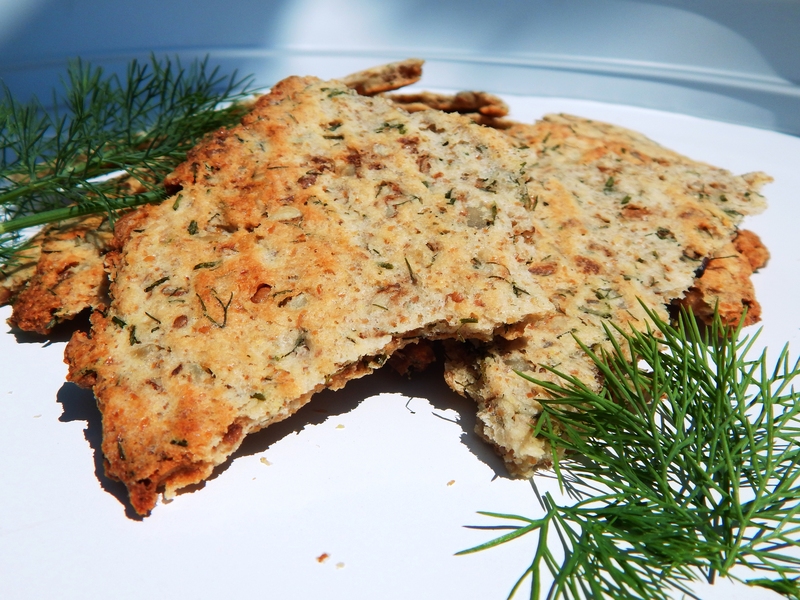 * Making an egg substitute with ground Flax Seed is easy! Take one Tablespoon of ground Flax Seed and whisk it with 3 Tablespoons of water in a small bowl and let sit for 15 minutes until it becomes a gel like consistency. 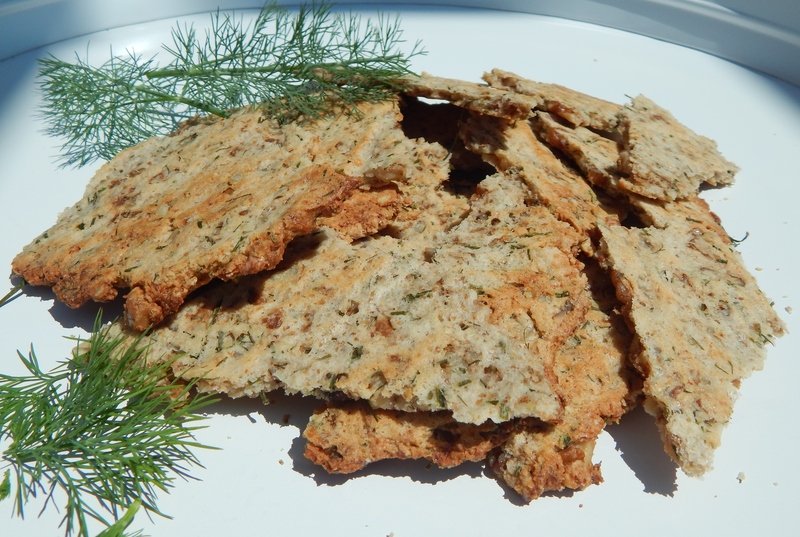 In this recipe I have used two Flax Eggs, so you would take 2 Tablespoons of Ground Flax Seed and 6 Tablespoons of water, whisk it all together and let sit for 15 minutes while you prepare the rest of the cracker ingredients. Preheat the oven to 325º degrees, and line a baking sheet with parchment paper. In a medium bowl, add your almond flour, dill, chives and salt. After your flax eggs are ready, whisk in the honey. Then, add the liquid to the flour mixture and whisk with a fork until well combined. Add in the chopped walnuts last, and incorporate into the dough. Place the dough between two sheets of parchment and roll out with a rolling pin to 1/4″ inch thickness. Remove the top parchment sheet used for rolling, and put the rolled cracker dough with the bottom parchment on the cookie sheet. Place in the oven and bake for 15 to 20 minutes until golden brown and crunchy. Keep a close eye on them the last five minutes to prevent over browning. Cool on a wire rack, and then break them into whatever sized pieces you like! These are delicious served with my Roasted Eggplant and Red Pepper Tapenade Recipe or Dairy Free Fresh Basil Pesto. If you would like more appetizer ideas, go to Kelly Bejelly’s post on her blog, A Girl Worth Saving, and check out her 35 Paleo Appetizers post here! DIY Natural Skin and Beauty Care from Your Kitchen! Nature’s Kitchen is an inexpensive way to reap natural benefits for our skin, health, and natural beauty care! 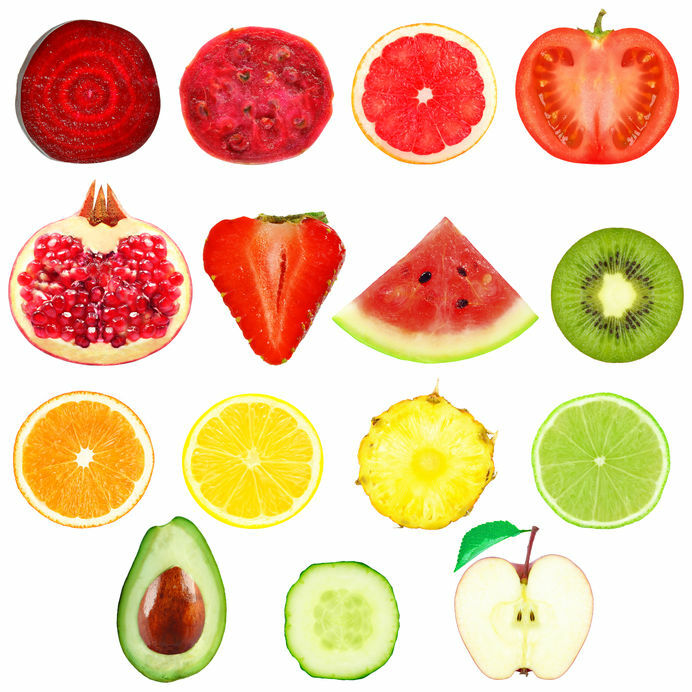 This article on how to use Lavender, Tomatoes, Cucumbers, Mint, Strawberries and Citrus from your local farm market or garden has some useful tips, such as a tomato facial for sunburn, and putting fresh mint leaves in water to sip throughout the day to keep you hydrated and your skin glowing! What are you doing this weekend to nourish your body and soul? 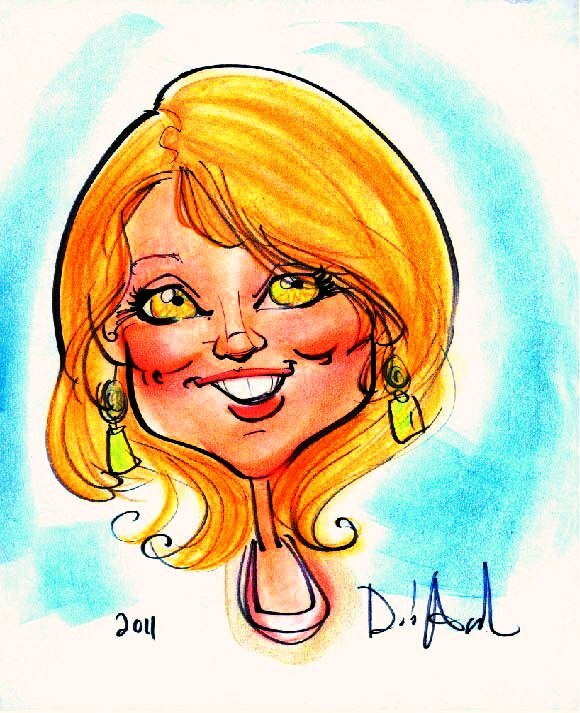 I hope you enjoy your Memorial Day weekend with some restorative time spent doing something you love! I will be traveling to Michigan to enjoy some outdoor time with family, visiting the local Farm Market, hiking with my pugs, and being free from any to do lists or schedules for a few days! For more wellness tips, go to sandrashieldshealthcoach.com and sign up for my free monthly newsletter! There is an abundance of fresh greens available during the growing season. 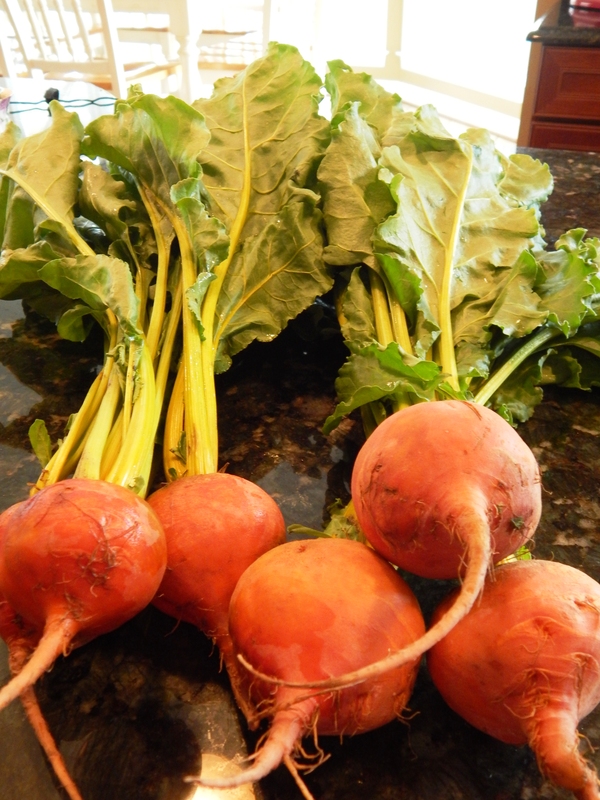 Have you ever tried beet greens? They have a mild, appealing taste, and I like to mix it up to get in as many nutrients as I can. Beet greens add variety to your diet, and are quite tasty, not to mention they have more minerals, vitamins and antioxidants than the root. The greens are best when they are young and tender. I found a bunch of golden beets recently at the local farm market, and the greens were glorious! Check out the second photo below! It was such a great find to be able to eat the whole vegetable, tops and all! Here is an easy way to cook them up quickly and deliciously! In a large sautee pan on the stove top. Pour in the oil and heat over medium high heat. Add the garlic if using and red pepper flakes, cook briefly, about 30 seconds. Add the beet greens and toss until wilted and tender. Add salt and pepper to taste. Sprinkle with the pecans. This is an easy and delicious side! Complaining and Negativity can affect our Spirit. 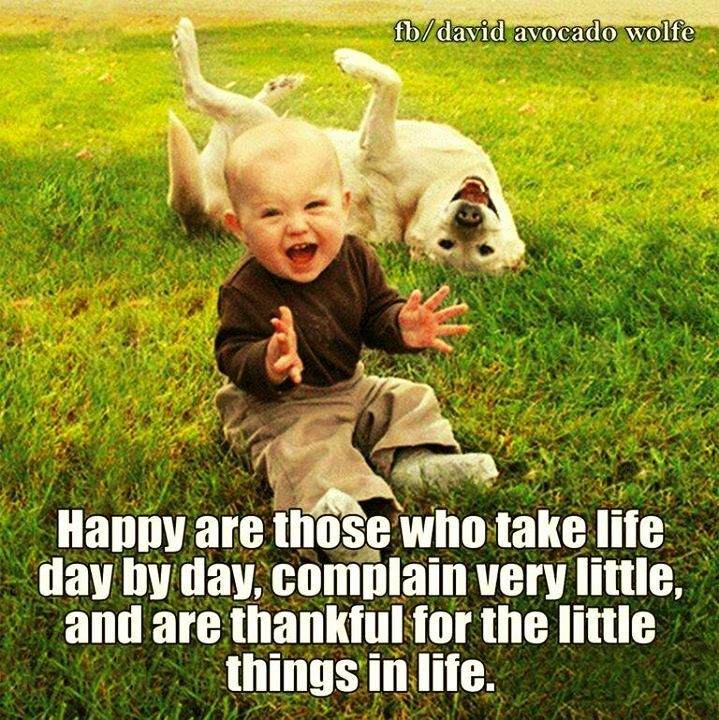 In contrast being Thankful makes us happier. It boosts serotonin in our brains (a neurotransmitter that affects mood regulation). 1. Before you step a foot out of bed this week, write down on a notebook, on your nightstand, at least three things you are thankful for. It can be just the fact you can get out of bed, or toilet paper, fingernails to scratch an itch, salt, trash collectors, you get the idea. This morning I was thankful for the birds singing outside, the blueberries I was going to put in my smoothie, batteries, and that is was a yoga morning! 2. Catch yourself every time you are going to complain about something and stop before it leaves your lips. This can be hard if we are in a rut of complaining, but I promise you, as you complain less, it will get easier and easier. So keep at it! Your positivity will increase over time, and this will increase your joy. Take these steps one day at a time. This means if you catch yourself complaining, don’t “throw in the towel”. Try again. It is okay to not do it perfectly. We all mess up. 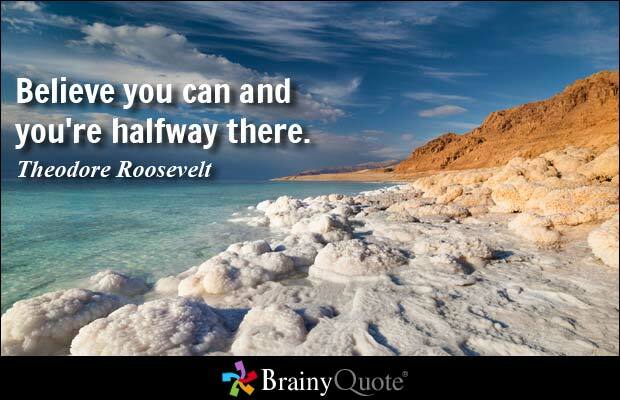 The important thing is you are moving toward positive change! Now, next Monday morning look at your list. What are all the things you were thankful for during last week? How do you feel? Do you feel more positive, happier, content? How has your being positive and not complaining affected your interactions with others? Have you noticed anything different? Share below some of the things you are thankful for to get you started on the road to a more positive self! Enjoy your day! This recipe is so easy on a busy week. The cook once eat twice concept is a lifesaver for today’s busy lifestyles! I was talking to my sister on the telephone yesterday, and she has three children in five sports this Spring and is really struggling to put good food on the table. I hear her! It can be challenging to churn out healthy meals for the family no matter who you are, and busy Mom’s can really benefit from some fast recipe ideas! 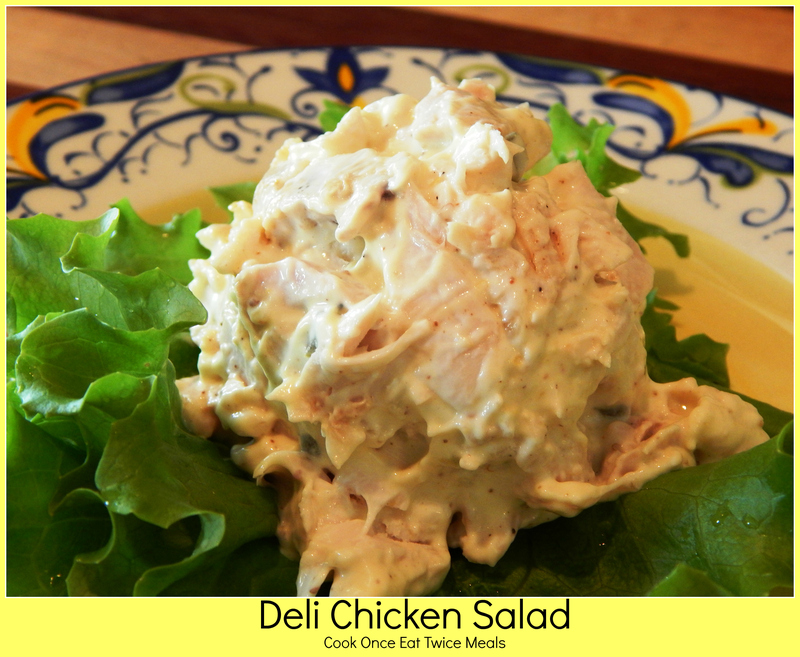 My deli chicken salad recipe uses leftover roasted chicken. I used a chicken from my Lemon Herb Juicy Roasted Chicken recipe here. I had leftover roasted chicken and needed something quick on Monday night. I find chicken salad is so much moisture when you use the whole bird, (a mixture of dark and light meat). To cook once eat twice, depending on the size of your family, you will need one or two whole chickens. Make the Lemon Herb Roasted Chicken recipe, or another favorite whole roasted chicken recipe the first night. 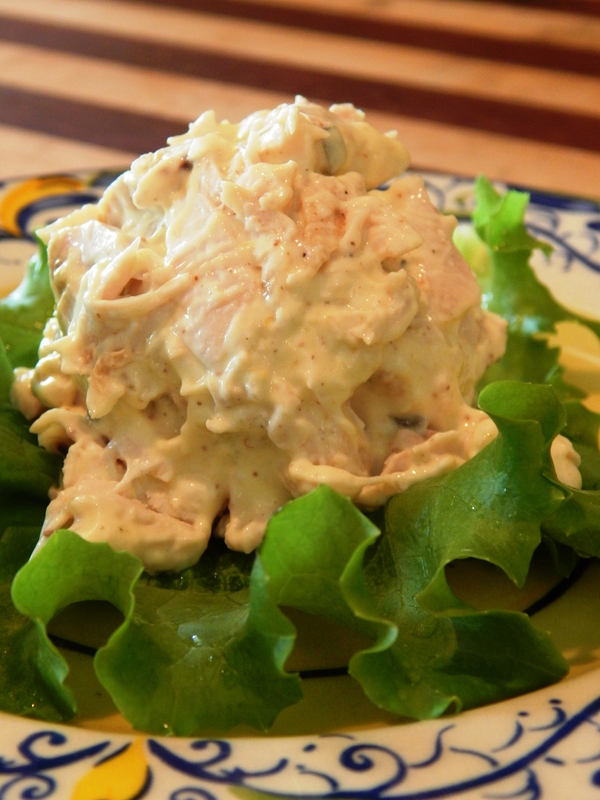 The second night, you will shred the leftover cooked chicken and put together the chicken salad in ten minutes! Directions: Just mix it all together and serve it. Someone is sure to lick the bowl clean! Tip: Double the recipe for even another day packed in lunches! At the end of a hard day, I am ready for a hearty meal that includes vegetables, Omega 3’s, healthy carbohydrates and fats. I want it to leave me feeling replenished, well fed and my belly full. If this is you, then this salmon recipe is what you are looking for! 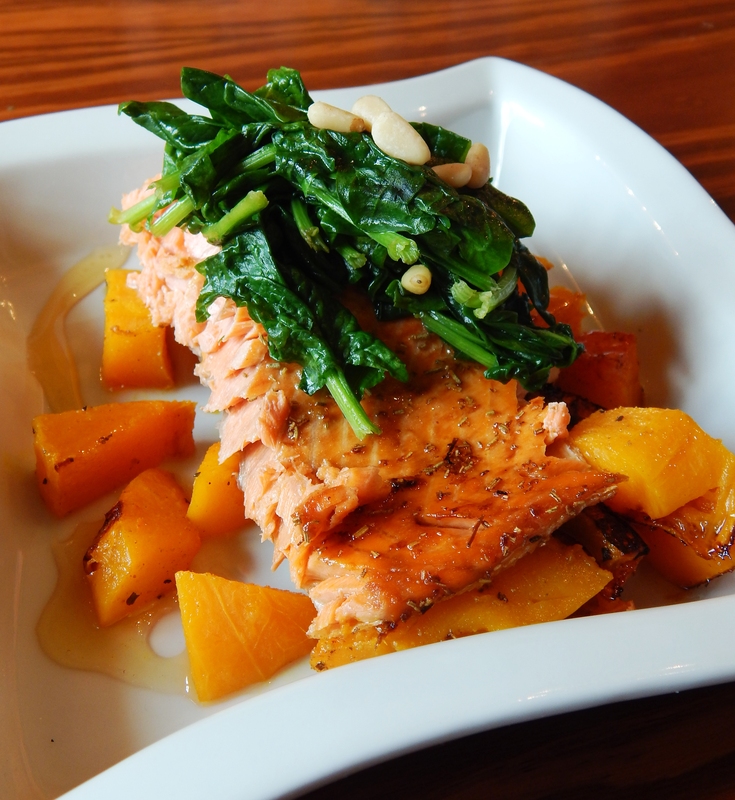 Join me in creating a beautiful, nutrient rich salmon entree! 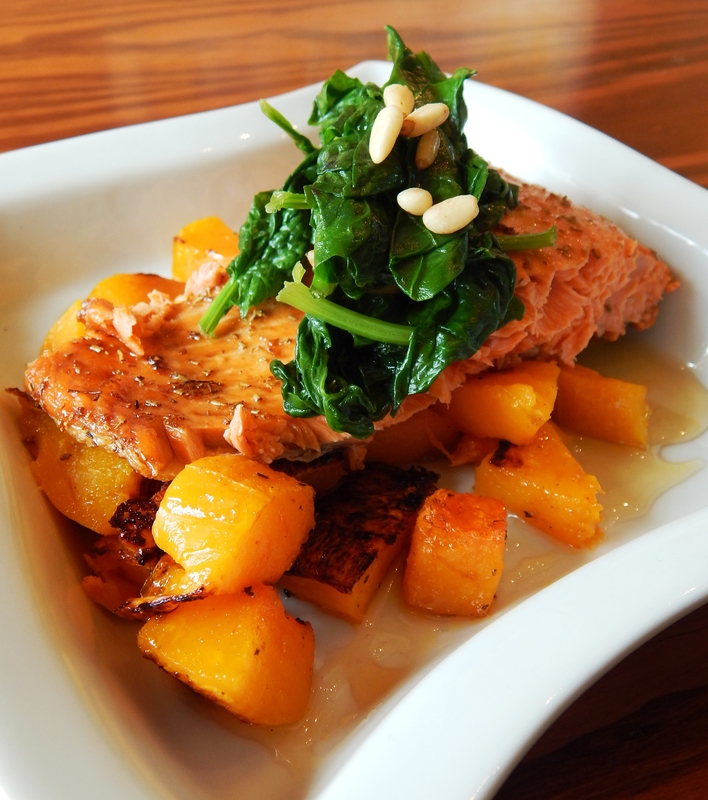 The drizzle of honey around each plate pairs beautifully with the salmon and butternut. Just a touch of honey creates a Umami flavor and takes the dish to extraordinary. Although this entree looks restaurant fancy, I promise it is not too difficult. The hardest part is peeling the butternut squash. Tent with Foil to keep warm and then turn your oven to broil (high) and place the baking rack on the second level from the top of the broiler. Lay Salmon on a parchment or foiled lined, rimmed baking sheet. Mix Olive Oil, Lemon Zest, and Salt in a small bowl and brush on the Salmon. Broil the salmon under the broiler for approximately ten minutes or until the thickest part of the salmon reaches 145º degrees. In a large sautee pan, place Olive Oil, Garlic (if using) and pine nuts. Turn the burner to high, and toast the pine nuts in the oil until lightly brown. This happens quickly (just a minute or two). Add the spinach and salt. Toss until spinach is wilted. To plate your dish, start with roasted squash on each plate. Top with a generous portion of broiled salmon. 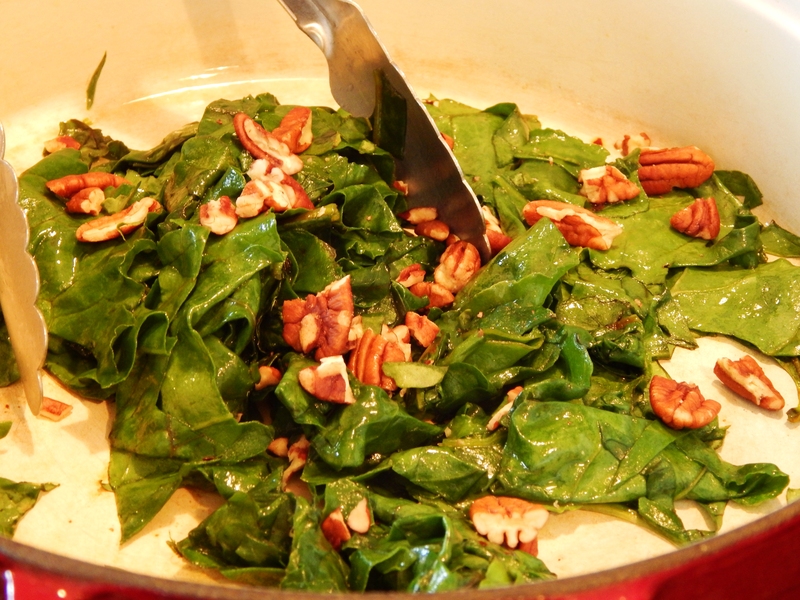 Finally, add the sauteed spinach, and drizzle with honey…..so Delicious!